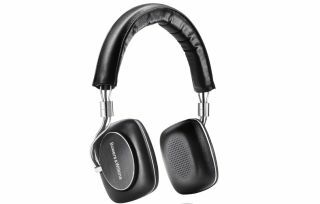 B&W launches P5 Series 2 headphones | What Hi-Fi? B&W's hugely successful headphone range has a new addition in the form of an upgraded P5 model that uses new drivers adapted from the bigger brother P7 headphones. Due on sale this September, we've had an exclusive look at the new B&W P5 S2 headphones - and you can take a look in our unboxing video below. The P5 S2 over-ear cans claim to combine the sound quality of the P7 headphones with the portability of the original P5 headphones for "unheard of levels of detail and dynamics in a portable device in this class". The key new features in the B&W P5 S2 headphones are new drivers, upgraded internal components and an improved Made for iPhone mic and remote. The drivers feature a suspended diaphragm design, "more like a traditional speaker than other headphones", in an effort to deliver a more accurate sound, also helped by tweaks to "just about every internal component" and a patented new design of the chassis and internal circuitry. The position of the ear cup has been realigned for a more optimum fit with the average ear, while new memory foam ear cushions should ensure the P5 S2 earphones are comfortable. As well as an upgraded mic and remote, B&W claims to have strengthened the jack and cable in an effort to make the P5s more durable. The B&W P5 Series 2 headphones are due on sale later this month for £250.